This is an undeveloped, natural area that protects Woodfrog Lake as well as a short section of the San Jose River. 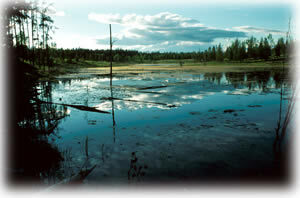 Situated just north of Lac La Hache, Cariboo Nature Park forms part of the Cariboo Basin. Cariboo Nature Park is just off Highway 97 approximately 40 km north of 100 Mile House or 15 km north of downtown Lac La Hache. Approved Purpose Statement and Zoning Plan [PDF] for Cariboo Nature Provincial Park is available online in pdf format. Pets/domestic animals must be on a leash at all times and are not allowed to harass wildlife or waterfowl. You are responsible for their behaviour and must dispose of their excrement. Backcountry areas are not suitable for dogs or other pets due to wildlife issues and the potential for problems with bears.